Make sure to check out the documentary on photographer Bill Cunningham, whose images have been gracing the pages of The New York Times since the late 1970s. He has two photo-heavy columns — one on street fashion, “On the Street“; another on society, “Evening Hours” — that appear in the newspaper’s Sunday Styles section. Because he celebrates those who make a statement, we wonder: which players’ styles would make a tennis edition of “On The Street”? Venus? Nadia? Bethanie? 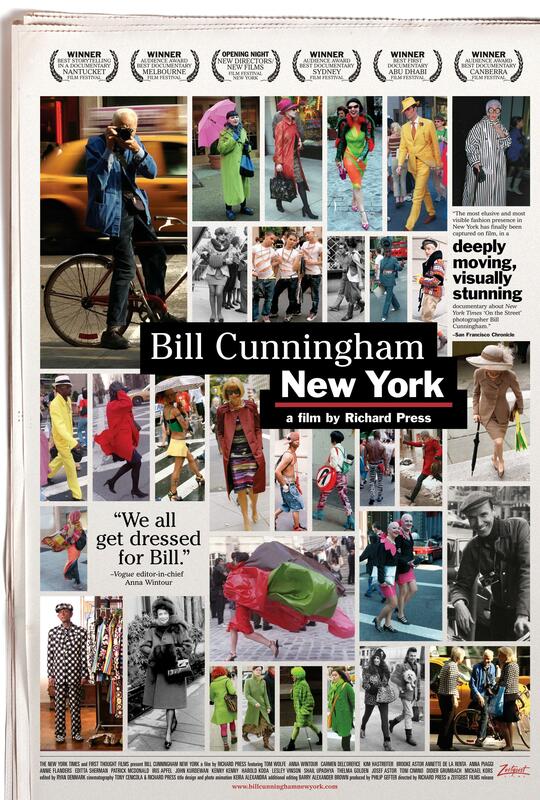 More info: Including trailers, bios, reviews, and other bits — Bill Cunningham New York. The WTA’s release some fluffy behind-the-scenes footage from that photo shoot accompanying the long article on the current state of the women’s game in last Sunday’s New York Times (was that really just one week ago??). View: Click on that photo above to watch the YouTube vid. Thankfully no one chose that mesh short-sleeved tank that was on the rack — though Kimmie got awfully close! And does anyone else think that this seems like an awful lot of glitter and powder for athletes to be inhaling? This Sunday’s New York Times Magazine has an article in this Sunday's edition about the power game dominating women's tennis. It's bundled with slo-mo video of top WTA players — Serena, Dementieva, Stosur, Clijsters, Jankovic, Zvonareva, and Azarenka — wearing designer dresses while hitting balls. Our fave is Jelena in Herve Leger. Meanwhile, wtf is Sam wearing??? Can’t wait to buy the paper on Sunday! Two snaps for Taylor Dent, who’s still searching for his groove after a long-term absence from the ATP Tour to address a serious back injury (it left him in a body cast for nine months). He is also a wild card in the main draw of this year’s U.S. Open, which starts next week. In the meantime, he’s trying to get match-tough by working his way through the Pilot Pen Tennis tournament this week. And two snaps for Nick, who got Dent’s story in the NYT‘s Straight Sets blog. Read it here. (off-topic) more photos: ryan mcginley and annie leibovitz shoot hollywood, julian schnabel’s pink giant, polaroid shutters, etc. Shake it while you can: The higher-ups at Polaroid have decided to get out of the instant camera business. They are shuttering their operations in Massachusetts, making enough film to last only through next year. You can keep your fingers crossed, though — there’s a likelihood of the technology being licensed for third-party production. But until that happens, you might as well stock up! Vanity Fare: The pictures shot by Annie Leibovits for VF‘s March Hollywood issue are impressive as always (one here). But our reason for snapping up the pub are images of Julian Schnabel‘s pink WeVil monstrosity, the Palazzo Chupi. Hollywood, pt. 2: The New York Times got in on the Hollywood (aka Oscar) buzz with last Sunday’s NYT Magazine. 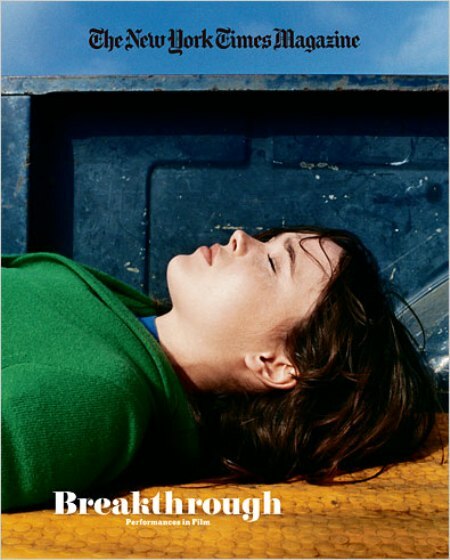 Ryan McGinley shot the cover story. They’ve posted a behind-the-scenes video, also directed by McGinley, online. And I’ve posted the mag’s cover here. Glowing shuttlecocks! : While night tennis might have failed, everyone’s a-ravin’ about Blackminton. Tursunov rallies for support: At a tournament overshadowed by the arrival of Becks, Norcal-based Dmitry Tursunov makes a plea to his fellow players: promote the sport any way they can, be a little friendlier with the fans, and do things to keep them coming back. Revealing the secrets of celebrity: You want to become the next Anna Kournikova? Follow this L.A.-based agent’s instructions. 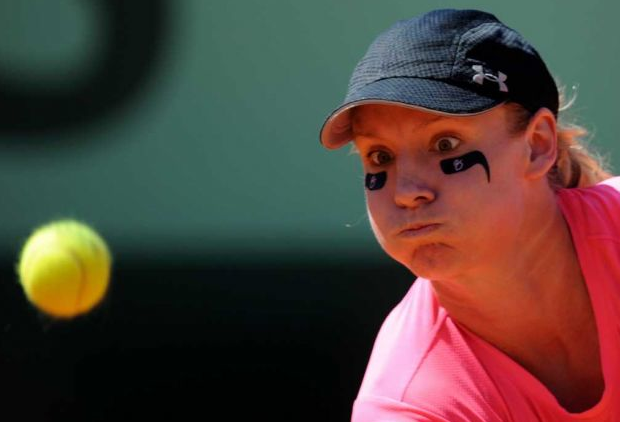 short balls: from both sides of the pond, juniors tennis, masha mania continues, etc. But it’s not all bad: Tennis.com’s Peter Bodo reminds us that Donald Young is a man who can back up the hype. 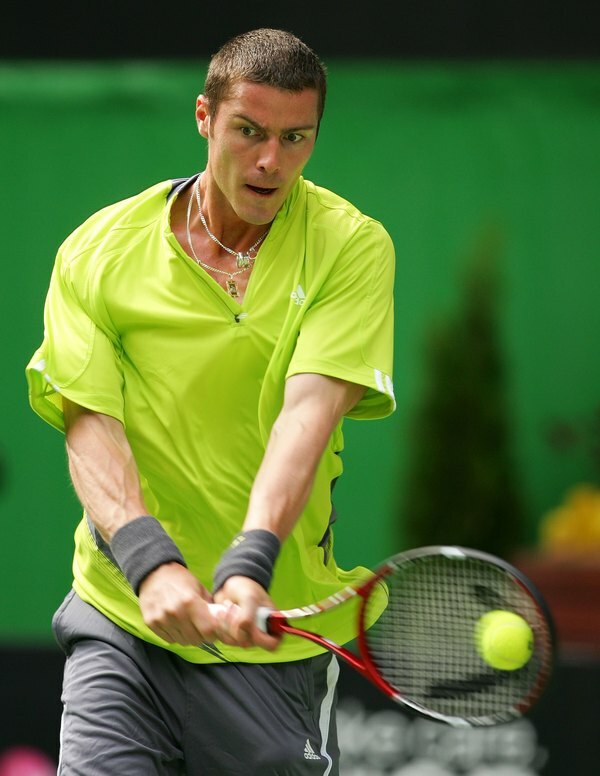 Justin Gimelstob also chimes in about this 2007 Wimbledon juniors champ. ESPN continues to tout Sharapova: Even though Serena Williams and Roger Federer have much better tennis credentials than Sharapova, the Russian continues to eclipse them in pop cultural significance. This time, she’s the only tennis player left standing in Page 2’s “Who’s Now” contest. From both sides of the pond: British Prime Minister shows off his tennis guns while Britney Spears beefs up her arsenal. The pop star was spotted at a toy store picking up a racquet and some balls. Perhaps she’s made another play date with former hitting partner Howie Day? (OT, pt. 2) The new gilded age: Check out this New York Times article on how modern day robber barons deal with their wealth. short balls: venus’ necklace, Sochi grumbles, tiger’s lame, blake pens a tearjerker, etc. Venus’ jewelry: A few of you asked about Venus‘ Wimbledon necklace. Unfortunately I have no information about where she got it from. 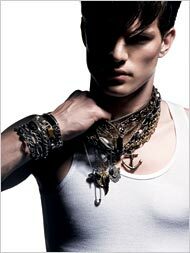 Instead, I offer the New York Times‘ recent slideshow on current necklace styles. Ellen Tien has an amazing eye for this stuff. Venus and Reebok: CNBC’s Darren Rovell talks about the relationship between Venus and Reebok (basically, that her endorsement — the largest in women’s sports history — was not renewed in 2003 because of her erratic playing schedule; she still gets paid to wear Reebok even though she’s not on their athlete roster). More grumbling: This time from the All-England Club, who didn’t appreciate that London Mayor Ken Livingstone planned the beginning of this year’s Tour de France on the same Sunday as the Gentlemen’s Singles Championships. The cycling tournament caused road closures that hassled spectators trying to get to Wimbledon. And the AELTC didn’t want to share the spotlight with any other event with such an international focus (which make sense). Tiger is lame: I think Tiger Woods is a great guy, but did he really need to be such a douchebag in that Gillette commercial that aired during Wimbledon? In it, Roger Federer strokes Tiger’s presumably smooth (post-shave) cheek, and Tiger turns to Thierry Henry with an awkward “uhh, did he just do that?” reaction. short balls friday: grass in NYC, open call for ballkids, racquet stringers, etc. In summary, Sampras doesn’t think much of the grass-court tennis currently being played. He doesn’t sound terribly convinced that he — soon to turn 36, five years after he walked away from tennis after winning his 14th Grand Slam title at the United States Open — couldn’t still get to the net against these guys, put away vintage Pistol Pete volleys. The “sad” problem, as Sampras sees it, is that players have surrendered to the slower conditions, the stronger rackets, the fear of risk. He has been watching Federer hang on the baseline, toy with lesser players who won’t dare push him the way Boris Becker and Stefan Edberg and Goran Ivanisevic and Patrick Rafter used to chip, charge and challenge Sampras across the 1990s. Smart move, Pete. Put your mouth where the money is. Now I can’t wait to see you play Federer in those Asian exhibitions this fall. Today’s slightly off-topic post comes from the New York Times and their article about Wrangler and the fashionization of cowboy denim — like, pants that can actually withstand the rigors of rodeo. Two things to note: their main style for that line is 13MWZ (which stands for “men’s Western zipper”) and they have a premium brand called Wrangler47, which is carried at Barneys New York and other stores. Bonus round: There’s also a video by Collier Schorr, who interviews some cowboys staying at the Cinderella Motel during a competition. Why do I feel like I’m watching a Sean Cody clip? Puma wrote me yesterday asking for a mailing address. 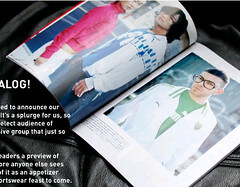 They’re sending me printed catalog! It looks like it’ll have all the French 77 goodies that we’re all dying to see. I’ll let you know when I get it….